If your snow boots are itching for an adventure, Scotland’s Cairngorm Mountains are a great bet this time of year—especially for animal lovers. 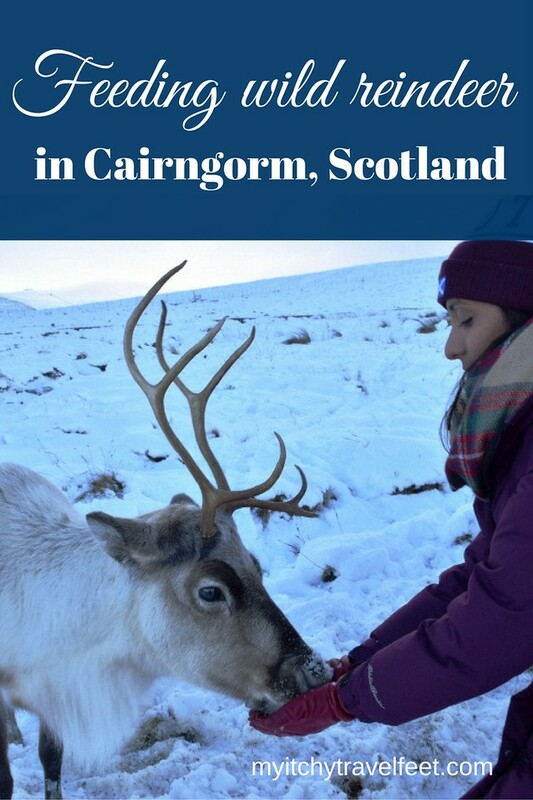 If you like the idea of trekking to off-the-beaten-path destinations to see wildlife in their natural habitat, guest contributor, Shaly Pereira from traveltoes85, is here to tell us all about traveling to Scotland for a Cairngorm reindeer adventure. Okay, let me be honest. I’m one of those baby boomers who’s not very fond of the cold. Born and brought up in a tropical country and living most of my life as an expatriate in the Middle East, I have always had a close relationship with the sun. I crib when it gets too hot, but put me in a cold place and I long for that blazing orb in the sky, like a dying man longs for water. I try not to visit cold places in winter. I did that twice before and both times, I was cold, frozen and miserable. 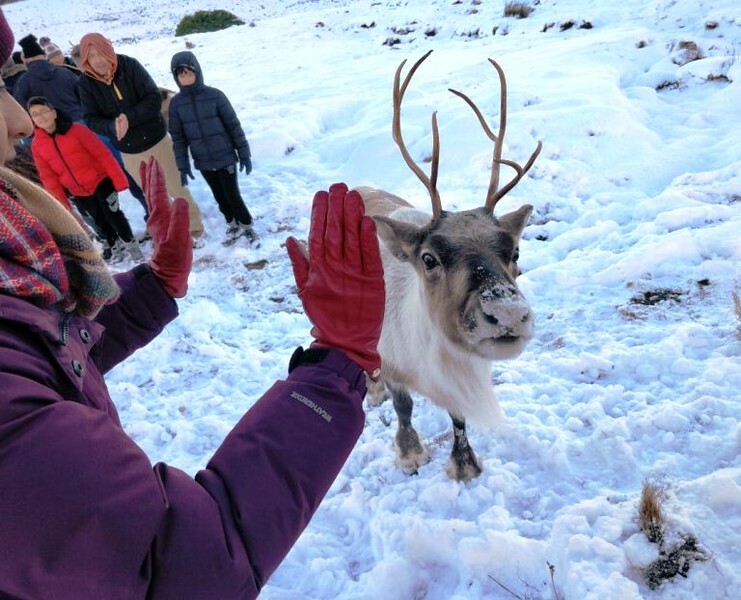 A nuzzle in return for a treat on a Cairngorm reindeer adventure. However, lately, with the spirit of adventure cheering me on, I am learning to actually enjoy the cold weather, albeit with a little help from mulled wine and vodka shots. My recent November trip sort of put the seal on my conquest over the fear of extreme cold. 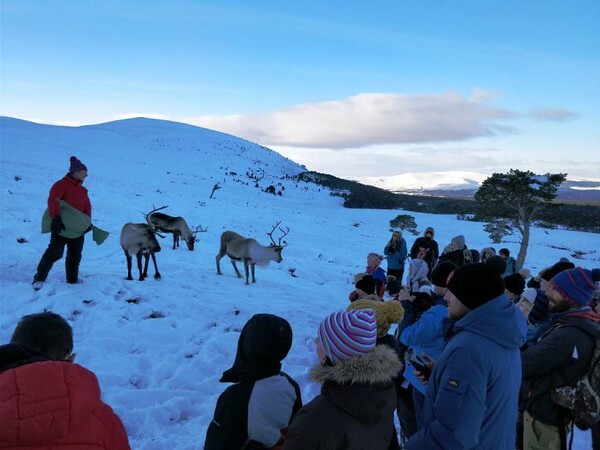 A 30-minute trek on a Cairngorm reindeer adventure to see Scotland’s wild reindeer was not only challenging but also left me with a sense of exhilarated achievement. The snow showers had arrived in Scotland and there was snow everywhere. Just two days earlier I had watched snowflakes drifting down steadily from the kitchen window at my Stirling accommodations. I had already been to Edinburgh and Glasgow and the snow decided to show up just before my highland trip. The wild reindeer live in the Village of Glenmore. Take the road from Aviemore to Glenmore for 6 miles. Pass Loch Morlich and Glenmore Campsite on the right, then look out for the Reindeer sign. Prior to embarking on this trip, you need two things—one, a map of the Scottish highlands, and two, some good advice. Take both the map and the advice, the latter usually tells you how to dress warm and to wear the right boots. The Cairngorms, you will learn, is the snowiest and coldest plateau in the British Isles. They kid you NOT. I had a self-sketched itinerary for the Scottish Highlands and the Cairngorms reindeer adventure was a big part of it. I started the drive at 6.30 am from Fort William, a small town that is the gateway to Ben Nevis—the highest peak in the United Kingdom. The plan was to drive up to Inverness and then down to Aviemore. Unfortunately, it had not stopped snowing since starting out, making the roads slippery and dangerous. Because it was still early, the Gritters (vehicles that spread grit, sand, and salt on the ice) had not yet been to work, so I ended up driving back down towards Fort William, passed by Spean bridge and took a different road up to Aviemore. Has this article inspired a Scotland-based boomer adventure? Start your search for hotels in Scotland with us. From Aviemore, we drove for a further six miles through beautiful countryside into the Glenmore Village, a part of the Cairngorms National Park, the largest national park in the UK. Right next to the center is a Reindeer paddock. If you’re unable to trek up the hill, you can do the next best thing—meet and pet a few reindeer here for £3.50 each—approximately $4 U.S. I browsed around the Reindeer Centre which also doubles up as a shop that sells books and reindeer related gifts and products. But what interested me more were the sturdy Wellington hiking boots that I hired from them at 50 pence each—about 70 cents U.S.. Off came the sports shoes (they were useless on the ice) and on came thick socks and Wellingtons. A little information before we set out. Finally, fully prepared, I drove another mile to the Sugarbowl parking lot, which is at the bottom of the Cairngorm mountain. This is the meeting point for hikers. There were about thirty of us, including quite a number of children, who cavorted around in the snow, transmitting their excitement to the adults. Predictably, by the time the group started out, we were all quite an enthusiastic bunch. Two ‘herders’ accompanied us on this trek. They both had food sacks on their backs for the reindeer. Prior to the climb, they gave a short introduction on the historical background of the wild reindeer. The 30-minute walk over snowy, icy terrain calls for a reasonable amount of fitness. However, the herders walked us through a slow and steady pace with stops in between. 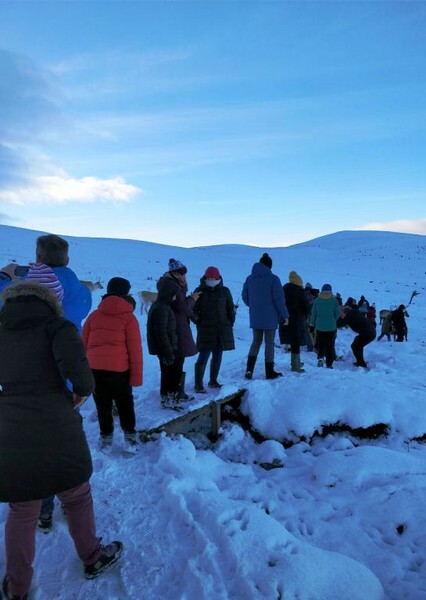 These brief stops not only served as a resting period but were also an opportunity to gain more information about the reindeer. The Cairngorms has been the reindeer home since 1952, a wild picture postcard expanse of 10,000 acres where more than 150 wild reindeer roam freely to their heart’s content. 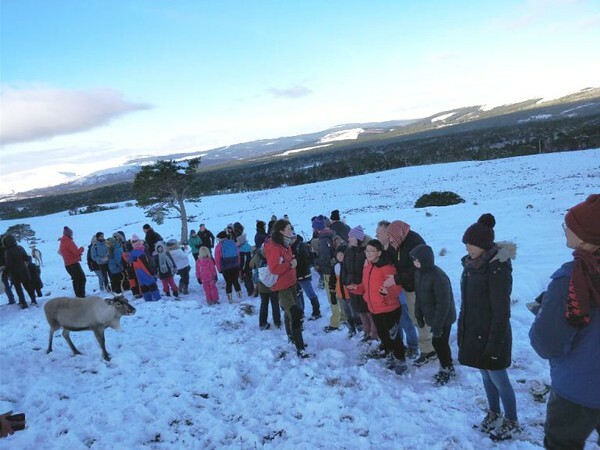 The official website states that since 1990, the reindeer herd has been split between the Cairngorms and Cromdale hills near Glenlivet in order to facilitate breeding and prevention of disease transmission. Walking through the woods on the well-worn snow-covered paths, I enjoy the surreal views. Pine trees, birch leaves, shrubs, grass and lichen line the path, with every brushstroke of green having a sprinkling of sparkling snow on it. I’ve heard there are mushrooms here too. The reindeer probably know exactly where. Best friends always carry food. A young family is in the line right behind me, the little girl sitting on her father’s shoulders and the mother hanging on to her son who is squirming in excitement. The first 10 minutes are pretty easy but soon the climb becomes steeper and slippery. As we go up the hill, it gets colder and colder and I can hear myself breathing hard. Just a little camera shy. And then, suddenly the little girl begins to sing, helped by her dad as she stumbles over the words. It’s a Christmas carol. “How apt,” I think as I glance around me. It is indeed a winter wonderland. The sun is out somewhere and its reflected light is dim, but it makes the snow glisten in patches here and there. Have these snowy photos inspired you to take a cold weather trip? Check out our favorite Winter Travel Destinations! Soon I realize there is a considerable gap between me and the person in front. I stand aside and let the young family pass me by. Looking behind, I notice with amusement that I am now trailing behind with the huffers and puffers. Met some husky friends along the way! So I stop for a few moments and enjoy the vast expanse of snow-covered terrain. Rows and rows of trees gently slope downwards. In the distance is Loch Morlich. The blanket of white continues as far as the eye can see. It is the not the first time I have seen snow but it is definitely the first time I have seen so much of it. I’m completely entranced. 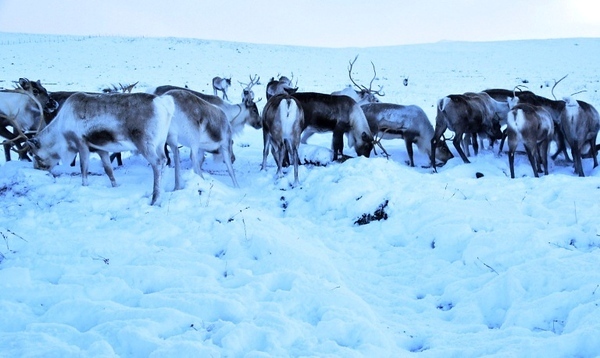 In about 20 minutes we reach the first enclosure with only a few female reindeer in it. We are on flatter plain now and continue onwards for another ten minutes crossing a couple of small man-made iron bridges. I suppose in summer there would be streams flowing under them, but now there’s just piles and piles of snow. The herd awaits their guests. Soon we reach the second enclosure that is home to the majority of the herd. This enclosure is fenced in at about 6 ft. Going over instructions. The reindeer are great listeners! At first, we do not see any reindeer. Seeing our disappointed faces, one of the herders, Imogen, says with amusement “That’s why we call them free roaming.” But then she cups her palms around her mouth and calls out to them in a long drawn out call. We wait and in less than a minute a group of reindeer appear, antlers first, over the horizon; their ghostly shapes in the fog getting clearer as they come trotting towards us. A distinct clicking sound can be heard and it gets louder as they come closer. Imogen explains that the click is produced when the tendons in their broad feet involuntarily rub over the bone as they take a step. With so many reindeer around, there is a lot of clicking going on. 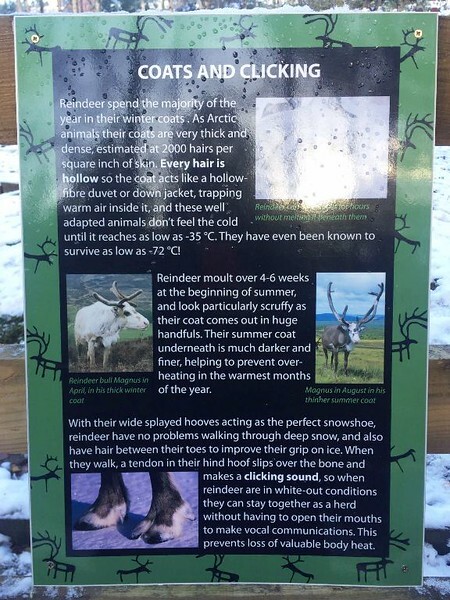 Having had sturdy Scandinavian ancestors, our incredible Scottish reindeer are completely comfortable in this ice age setting. 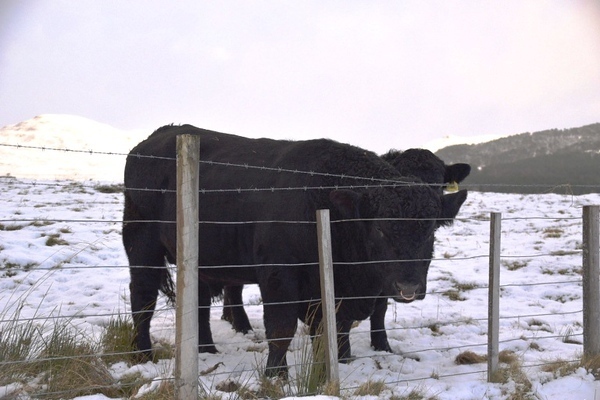 They have evolved in some of the harshest winters with double layers of insulated fur (oh so soft to the touch) and fat reserves that they have stored up with all that summer grazing. By now the reindeer are wandering amidst us, or are we wandering amidst them? I’m not sure but it sure is magical. They know exactly what is in the food sacks and obviously approve of the recipe—a mix of barley, grains, molasses and uh a lot of other stuff which I don’t quite catch. As they begin snuffling impatiently at the sacks, the herders patiently empty some of the treats on the snow. The rest are distributed among us as we excitedly stand in line with cupped hands. As I feed first one, then another reindeer from the feed in my hands, I am thrilled. Their soft noses and velvety mouths nuzzle into my palms and the food disappears quickly. Most of them have distinct personalities, the stronger ones pushing the younger ones out of the way. A few of us get gently butted by the frisky ones but most of them are extremely well-behaved and interested only in the food. Oh, and they don’t like posing for selfies. We spend about one and a half hours on this Cairngorm reindeer adventure, feeding them, petting them, photographing them, and simply enjoying being in their presence. Once the food in our hands and on the snow is all eaten, they seem to lose interest and wander off one by one. Soon the clicking fades into the distance, perhaps in search of some tasty lichens and mushrooms past the horizon. Take the shot from my best angle, please. 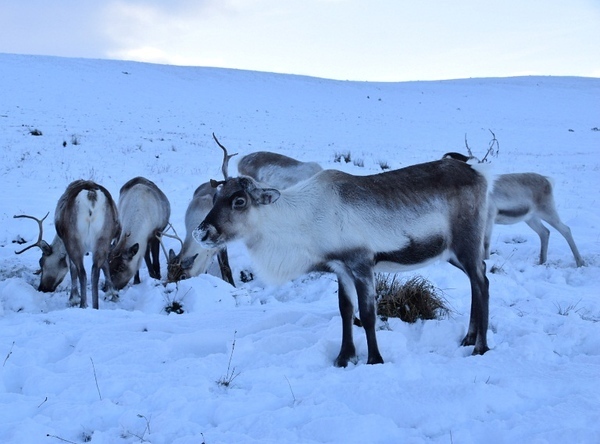 As you may have heard, the Cairngorm reindeer do work for a living. The adult males are trained to go out during the months of November and December on a nationwide tour increasing public awareness and raising funds for their own conservation. That beautiful Christmas postcard with Santa’s sleigh being pulled by reindeer truly comes alive on the streets of UK. The team also does promotional events and works in film studios. For just £39 (approximately $54 U.S.), you can help to support the conservation of these gorgeous animals plus get unlimited free admission for a year. More information at [email protected]. 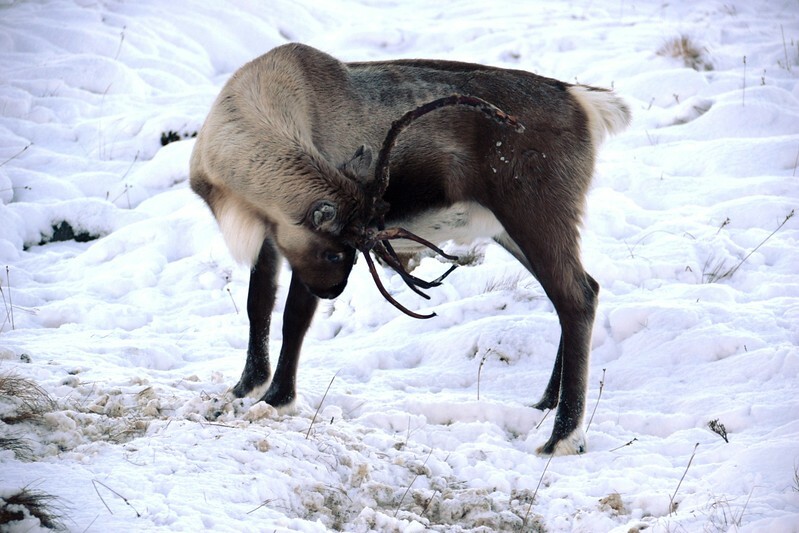 Cool Fact: Female reindeer grow antlers too, the only species of deer to do so. Way to go girls! 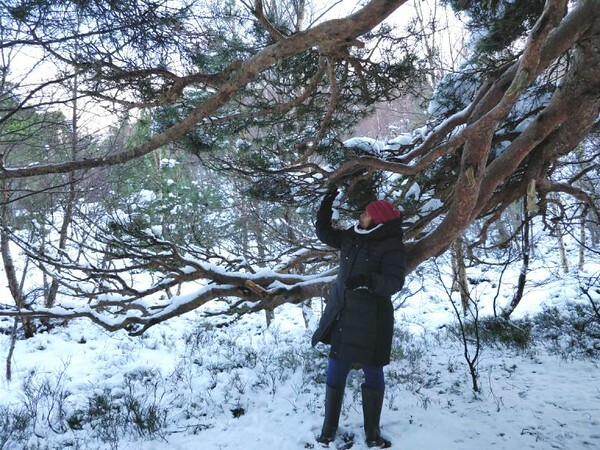 On the way down, we had a couple of snowball fights and invented a new game called ‘The Tree Limb Shake” where you gently shake a tree limb and get showered with snow. Our showers of blessings for the day! 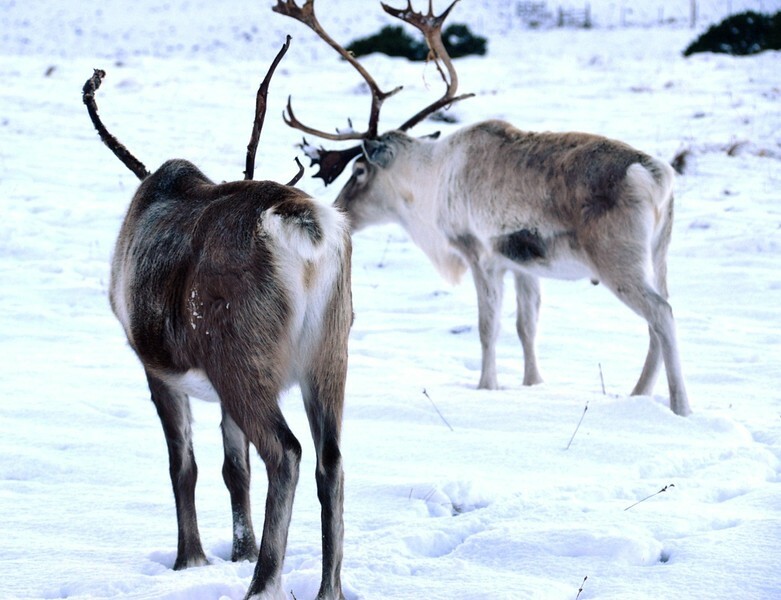 Have you experienced a Cairngorm reindeer adventure or another encounter with wild reindeer? Come join the conversation at the My Itchy Travel Feet page on Facebook. Or send us an email with your thoughts. Shaly Pereira is a freelance writer, blogger, and habitual traveler who loves to write about people and places.She writes travel stories, mom stories, fiction and personal essays, at times using her skill to bring attention to social issues. She has been published in Oman Today, SacParent.com, Afineparent.com, Parentco, Fiftiness and Sonderers Travel Magazine. She blogs at traveltoes85.